Concerned about the safety of your cellphone? Do you have unexplained symptoms your doctor can't treat? Have you recently been diagnosed with cancer or another serious illness? 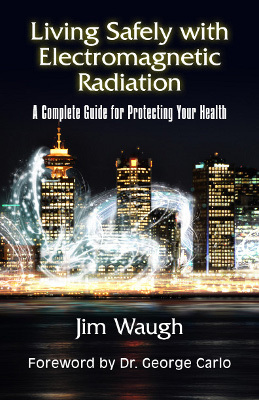 If you're looking for the truth about electromagnetic radiation (EMR), this is the book for you. It cuts through the rhetoric and the controversy to give you the facts about EMR. But it doesn't stop there. The book also gives you simple, doable steps for testing your environment and protecting yourself from the dangers of EMR. Empower yourself with knowledge. Get the tools you need to begin decreasing your exposure to EMR. Start now by reading this book! How It All Started * What Is Electromagnetic Radiation? * What Are the Concerns? Jim Waugh has an engineering degree with considerable business and technical experience. Drawing on his background and knowledge of electromagnetic radiation (EMR), he assists clients in reducing their exposure to this environmental pollutant. Through home and office inspections and low-EMF design consultations, Jim coaches his clients to create safe living and working environments while maintaining full benefit from their electrical technologies. Jim is active in raising public awareness of the health risks associated with EMR through classroom workshops, discussion groups and magazine articles.